NOTE: TamModized is a required mod in order for VoidCraft to run. TamModized is a Library of shared code used by all of my mods. If you're interested, it can be found here. The goal is to be a magic mod focused around being a healer. You have the ability to heal players, other entities and even damage undead with this power. You can also cure status effects. However, there are two other classes you can use instead. Three in total, Healer, Caster, and Defender. Healer's purpose is to well.. heal. The Caster is the offensive spell casting mage which uses light based spells to destroy undead. The Defender is your tank, they get a dodge mechanic where attacks have a chance to not land at all on them. Defenders also get benefits while having a shield equipped. You'll want to construct a "statue" as shown here. Blocks used are all three vanilla polished stone types. Nothing more. After you have done so you must right click the center Polished Granite with a diamond in hand. 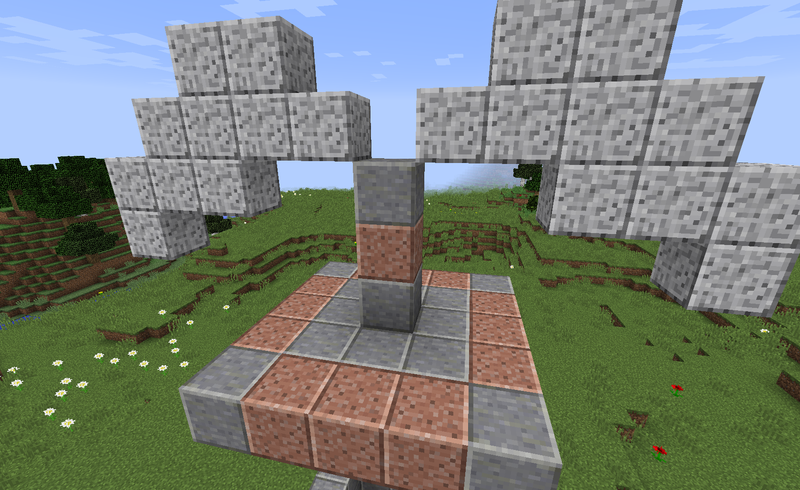 The statue is then shrunk down to a single block size in which you can right click. From here you can make a choice to select a class. If you do not like your choices you may "reset" them to start over. Once you have spells set onto your new bar, you can toggle between your main hotbar and the spell hotbar by using the left Alt key, this is the default keybind but this can be changed in controls if needed. To actually use your spells, the bar MUST be active then you simple just right click while on the selected spell. Every time you use an Ability or Spell you can gain some experience. This experience is only granted if spells are being used as intended. After you collect a certain amount of experience you will Level Up. Every Time you Level Up you gain a single Skill Point which you can use to spend on new Skills within your Class Tree. The amount of Experience you gain can decay if the ability or spell you used is spammed. This decay is ability/spell specific so say you spam one ability, this means that decay will not apply to another. Each tick of decay will vanish after 30 seconds. It should be noted that unlike the Caster and Healer, Defenders gain experience through using a shield to block, landing any doublestrikes, and getting a successful dodge. Open up the Skills GUI by right clicking on the Angelic Statue, from here go to your Spell Book and click on which spells you want on your hotbar. You can remove spells from the hotbar by clicking on the slots of the bar. Once you have your spells set you can cast them in world by activating your spell hotbar via Left Alt (Default, this can be changed in Controls), selecting your spell, then Right Clicking. Open up the Skills GUI by right clicking on the Angelic Statue, head to Reset Skills. From here you have two options. 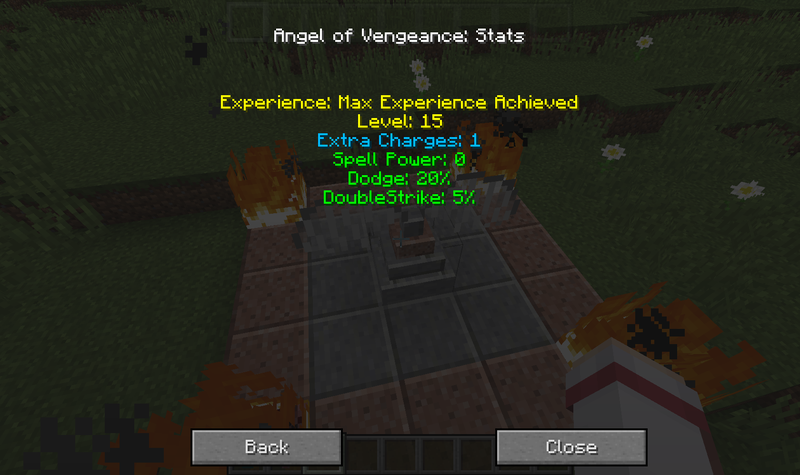 Casting spells uses a charges system, each spell has their very own amount of Charges which can be increased by skills. Every time you cast a spell that uses this system it will drain an amount of charges, depending on the spell this can vary. Charges are reset when you interact with an Angelic Statue. When you are attacked by certain damage types there is a chance you will not be hit by the attack, this chance is your total amount of Dodge. Dodge can be increased by skills and spells. You have a chance to strike enemies twice, this chance is the amount of DoubleStrike you have. This chance can be increased by skills and spells. Upon taking this, you are locked into the Healer class tree. You gain +1 Max Charges and are granted the spell "Cure Light Wounds"
This spell, when used, heals, at base, 4 damage (2 hearts). Requires at least Level 3 and that you have "Class Core: Healer"
You are granted with 10 spellpower. Requires at least Level 6 and that you have taken "Healer Core 2"
Grants 10 spellpower, +1 Max Charges, and the spell "Positive Energy Burst"
Requires at least Level 12 and that you have taken "Healer Core 3"
Grants 10 spellpower, +1 Max Charges, and adds the spell "Positive Energy Aura"
Requires Level 15 and that you have taken "Healer Core 4"
Grants 50 spellpower and +3 Max Charges. Adds the spell "Cure Poison" when activated removes Poison from the target. Adds the spell "Cure Wither" which removes Wither from the target. Adds the spell "Cure Blind" which removes blindness from a target. Grants the Invoke Mass Ability. While active: Spells that can use the Invoke Mass ability will cost double the charges but are cast as an Area of Effect (AoE) meaning they interact with multiple targets. Grants the Selective Focus ability which means your spells will no longer harm allies nor when they affect enemies if they benefit from the spell. Upon taking this, you are locked into the Caster class tree. You gain +1 Max Charges, 10 spellpower and are granted the spell "Nimbus Ray"
This spell, when used, creates a slow moving ray of light that damages for a base of 4 damage (2 hearts) this damage is doubled on undead. Requires at least Level 3 and that you have taken "Class Core: Offensive Caster"
Requires at least Level 6 and that you have taken "Caster Core 2"
Grants 15 spellpower, +1 Max Charges, and the spell "Flame Strike"
Upon using this spell, a mass of flame falls from the sky where you target and deals a base of 6 damage (3 hearts) of fire damage to entities in the blast radius. They are also set on fire for 15 seconds. Requires at least Level 12 and that you have taken "Caster Core 3"
Grants 15 spellpower, +1 Max Charges and the spell "Blade Barrier"
Upon using this spell, a ring of circling blades are spawned to deal damage to any enemy that touches them. Requires at least Level 15 and that you have taken "Caster Core 4"
Adds the spell "Searing Light" when cast shoots a quick bolt of searing light to deal a base damage of 8 (4 hearts) this damage is doubled on undead. Adds the spell "Slay Living" when cast, close range, will slay any LIVING creature. Bosses and Undead are unaffected. Adds the spell "Destruction" when cast will destroy a target, max distance 20 blocks. Works on Undead, does NOT work on Bosses. Grants the Ability "Leap of Faith" when used you quickly leap through the air and are granted with 15 seconds of Feather Fall. Upon taking this, you are locked into the Caster class tree. Requires at least Level 3 and that you have taken "Class Core: Defender"
Requires at least Level 6 and that you have taken "Defender Core 2"
While you have a shield equipped, you deal more knockback. Requires at least Level 12 and that you have taken "Defender Core 3"
While blocking with a shield, you block ALL angles now instead of just in front of your player. Requires Level 15 and that you have taken "Defender Core 4"
Shields you have equipped, if damaged, are fully repaired every 30 seconds. Adds the spell "Aid" when cast grants absorption and a 5 bonus to dodge for 5 minutes. Adds the spell "Shield of Faith" when cast grants the target with the Shield of Faith buff which cuts the damage they take in half. Sure, provide a link to either this forum thread, the curse page, or the github page. If you wish to support me and gain small cosmetic benefits, you can do so on my Patreon. I like this. Keep up the great work! Same here! The mod looks amazing! A word of advice: Include a basic description of what the mod is. It looks like a RPG mod, but I can't find a description of what it is. I... actually forgot to include that. Totally forgot, it's on the curseforge page at least lol. It happens. Just thought I'd point that out for you. It looks like an interesting mod - I'll probably give it a try once I stabilize my current game. Thanks for the word you put into it! 1. There is too small amount of spell charges for a huge amounts of mobs in dungeon. Returning every time to statue is annoying. Could we replenish amount of charges with every kill or over time? 2. It would be nice if we could use existing experience system. Dungeon generator set more exp for high-level mobs, but amount of exp in your mod is constant. I may turn these into config options, disabled by default, but sure. My reasoning for not using the existing experience system is that it leads to being a bit unbalanced for progression. Mods tend to make experience gain insanely easy plus experience can be gained in other ways than using my spells as intended. In other words it's very easy to gain the maximum level without any work at all using vanilla experience. This can lead to things such as people spawning in an angelic statue nearby, taking all the buffs from the defender tree and then doing a full reset only to regain all their levels in an instant through exploits so they can go back either caster or healer. That's something I try to avoid. But yes, I'll turn those two things into a config option of some kind in the future. Question, I've decided to choose the defender class, but I don't know how to level up the defender class, as I don't have a spell to start with and I didn't see anything specific on what other way there was to level. Ah right, forgot to really mention that anywhere, defender's gain experience through using shields to block, getting their attacks dodged, and landing doublestrikes. I believe I had their buff spells give experience as well. Recharge: This allows you to recharge your ability charges over time in seconds (NOT ticks), this is set to -1 by default which disables this. Experience: This allows you to gain experience in the mod using vanilla experience orbs. This is disabled by default. These will be in versions 0.2.3 and up, which are waiting for approval as I write this. 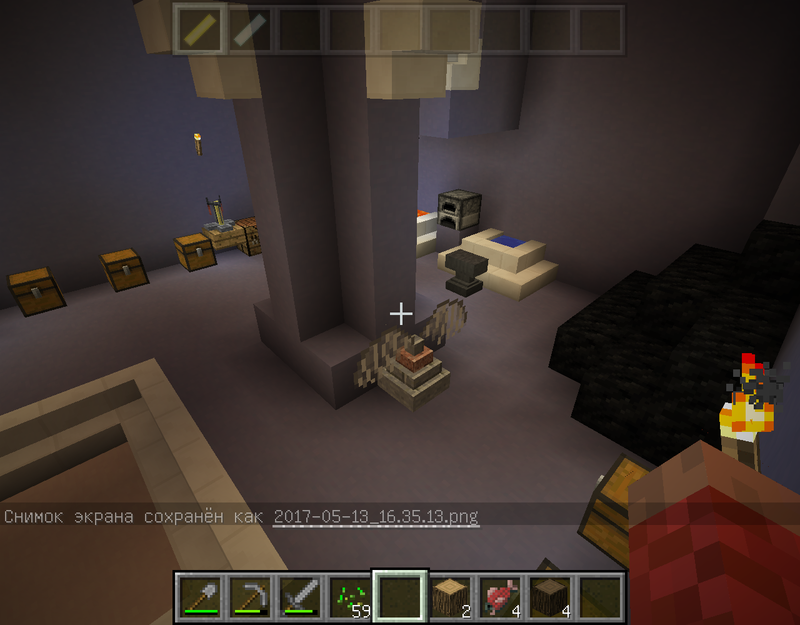 Dungeon generator for Cubic chunks mod version 0.1.1 or higher now generate an angel statue in "Workshop" room from AoV mod if it is loaded. Description may need to be updated to include the new Druid Class. Mainly for those coming here first.